We haven't done too much 'exciting' stuff in the way of preschool this week, other than our everyday stuff: practicing handwriting, counting by 10's, reading, and just having fun together playing together. Because Zachary has been taking a sign language class at our co-op this semester, I put together some 3 x 3 cards for him to use in learning the letters of the alphabet and also the number 0 – 9. Ours are printed off on cardstock, laminated and then hole-punched in the corner so that they can be flipped through to look at the letters/numbers and signs. We’re also going to use this great alphabet file folder game for Zachary’s workboxes that Val @ Christian Preschool Printables created. Jolanthe - these are wonderful! I love these thank you! I am teaching for Carter's (3 yr old) co op and this would be great to use:) Are you still teaching co op? These are great cards! I love to incorporate sign language every chance I get! Wow what great ideas with sign language! Great job! The cards are great! We are learning a song in sign language for our Christmas program at church! 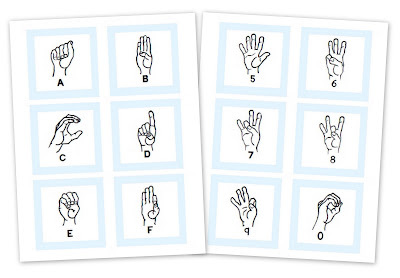 It's awesome that Zachary learns sign language and thanks for the links!